The Costa Rican government paid homage to the Costa Rican national surf sele at Casa Presidencial this week. 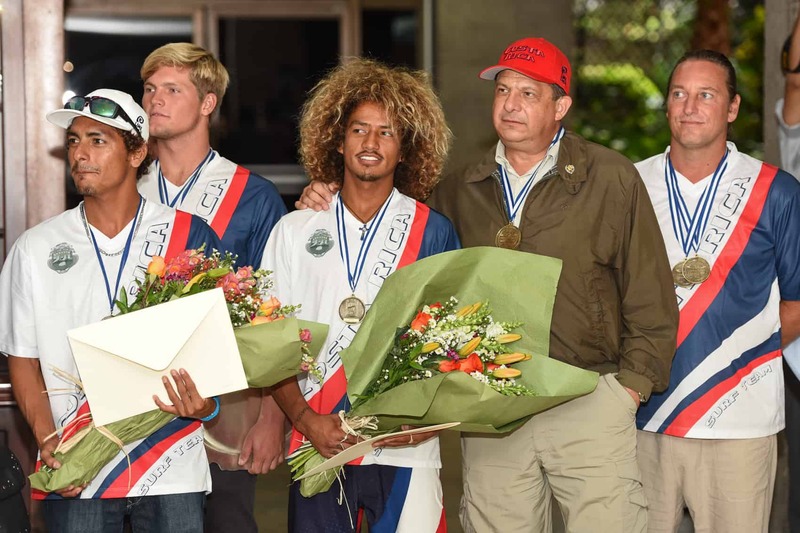 The team won the overall gold medal in the International Surfing Association (ISA) 2015 World Surfing Games held at Playa Popoyo, Nicaragua in June. Surfers Jason Torres, Noe Mar McGonagle, Carlos Muñoz (left to right in photo) and team coach Wade Sharp (far right) shared a moment with president Luis Guillermo Solís. Not in the picture, Lisbeth Vindas, Leilani McGonagle and Anthony Fillingim also participated in the activity. Noe Mar McGonagle won the masculine Open Division at the 2015 surfing games while his sister Leilani, was second in the feminine Open Division.